Laura and I haven't accomplished much on the boat in the past six months. I put that down, in equal parts, to weather, financial stresses, health and procrastination. But we got a lot done last Summer and, as always, we have big plans for this year. We have been thinking of applying an epoxy/copper bottom coating on Lealea for several years now. I called Wrangell Boat Shop in Wrangell, AK where we had the boat hauled out last year and asked them to work up an estimate. The cost turns out to be far beyond our means. Even though in the long run it would be cost effective, the short term expense is just too much. Fortunately the bottom should be good with it's Pettit Trinidad bottom paint for a couple of years. I'm going to continue to learn more about the copper/epoxy bottom coating idea. We first heard of it in in Hawaii at the Nawiliwili Yacht Club. A fellow member shared the recipe with us for their hom-brew copper/epoxy/teflon/chili pepper concoction and we were intrigued. Now, you can buy a copper/epoxy bottom coating kit from Coppercoat USA, LLC. We think it is a great idea. We think it's great if the cost is not prohibitive. So far, for us, the cost/benefit ratio is upside down. The estimate we got was nearly two thirds of the market value of the boat. Now, bear in mind: If we were twenty years younger, we would not be concerned so much with the cost of labor for this job. We would do most of it ourselves. We can still do a lot of it, but the reality is we need to hire yard crew to do most of the work. Another thing we are looking at is a larger prop. Lealea's Yanmar 2gm20f engine could stand a larger wheel. Since we find ourselves motoring more than sailing and less concerned about prop drag in the narrow channels between the islands of Southeast Alaska. The change should result in more efficient engine operation and better fuel economy. I'll need to get advice from those more experienced with prop design on choosing the right one. Meanwhile, Spring arrived on March 18th. Just like that. One day the snow and ice melted and the sun came out. It was 60 degrees and townsfolk were out in shorts and t-shirts busy, busy, busy. I took Hagar to the dog park. We are preparing to move back aboard Lealea in a few weeks. Laura is busy at the veterinary clinic. Doctor Hill is making plans to take the veterinary service vessel M/V Hallie around the islands this summer with Laura as crew. Lealea plans to head back to Wrangell for more work. Both boats expect to be meeting up from time to time until we both return to Petersburg in the fall. Yes!! We are back on the boat. Lealea is our home once again. The project still has a long way to go but we have our basic living quarters set up and we have moved back aboard. ...pretty much the normal live-aboard situation with a slightly longer To Do list. One drawback is that we have no internet access from the boat at this time. It is, however, just a short walk to the public library. Now that we have the boat comfortable, we will try to bring everyone up to date with the next video. The weather is finally improving and we are taking full advantage. We have been able to get a lot done on the project in the past couple of weeks and things are beginning to come together. The weather was perfect, bright, sunny and warm, for the Mayfest and Little Norway Festival this year. We went to the Pancake breakfast on Sunday and Laura tended the Humane Association table on Friday, but mostly we used the good weather to work on the boat. I talked to Tom, the KFSK Station Manager today after my show. He said they have had snow as late as the 4th of July! As of today, the 7 day forecast has snow into April. We hope not. While the really heavy snows are past (We hope), the sloppy conditions, cold and wet, snow and decaying ice on the ground and alternating rain and snow falling constantly, are challenging, if not outright discouraging. Still, we were able to make some progress below decks and, sooner or later, temperatures will rise above the threshold for painting and varnishing. Where have we been and what have we been up to? Well, to be honest, some pretty exciting stuff. Thanksgiving has quickly come and gone. We are house sitting again which provides us with a garage and work space we may use over the winter to finish more interior pieces. A ton more sanding, painting and varnishing in our future. I can't wait until this project is finished but it sure is looking pretty so far. After a brief and very cool summer enough of the interior was finished and we were able to re step the mast just in time for the first snow. We had hopped to raise it the day before but the day turned bitterly cold and just as we deciding; Go or no go, the wind picked up and quickly made the decision for us. We were bummed because it was highly possible that may have been our last opportunity but the next morning turned out bright, clear and reasonably warm. Thankfully we had a few extra hands and the job was complete in under three hours. The next day Chuck put the dodger back on and tarped off the cockpit. It snowed the next morning. Picking up new computers on Monday. For the last month or so we've been sharing a power cord slowing us down quite a lot. Both our units will now have the same operating system and video editing programs and we should be able to get quite a lot done. Summer is gone and Winter is here. Our friends who've been with us the longest know this is the time we are able to sit down and write, produce video and catch up with friends. Speaking of catching up, we are now 57 videos in our Refit. For our Patrons we will be introducing a once a month Dinner Series where we hope our Patrons feel as if they are breaking bread and sharing the dinner table with us. Similar to our Q&A series we hope to answer questions, share sea stories and some favorite recipes along the way. Drop us a line and let us know how your Summer went. Once we get our new computers operational you will be hearing more from us. We got the mast beam in! Hope to upload the video for our Patreon Patrons tomorrow, 7-14-2017. Those who want to watch on YouTube will have to wait. Next we will start putting the after bulkheads, engine box, cockpit locker walls and galley dividers in. Those pieces are all finished and ready to install. That part of the job should go fairly quickly with far less anxiety. Stay tuned! Making progress at last! Good weather, warmer at least, has allowed us to fit the main bulkhead and install the water tank, v-berth deck and divider panels in the forward cabin. The bunk is in and we could now sleep aboard if we had to. I have been working on the wiring. The new breaker panel came back from Clear Cut Plastics in Seattle so I am making a new backing plate and revising the wiring plan. I re-ran the wiring from the solar panels all the way aft, to the batteries under the main cabin sole. That is where I ran into another project that couldn't wait any longer. The main cabin sole is a molded fiberglass pan that sits over the bilge. It has two hatches in it for access to the batteries and the original fuel tank that we are no longer using. Over the years, a crack developed beween the two hatches. The crack turned into a tear and has been getting worse due to our walking on it until it can no longer be ignored. Yesterday I took my grinder to it and ground away the surface glass, revealing a partial delamination of the pan which no doubt contributed to the crack. More grinding. Then I cut several pieces of glass cloth, mixed up some resin, wetted out the surface and laid on five or six layers of 6oz glass cloth. I placed one layer on the underside of the pan, then starting with small pieces, filling in the hole and gradually increasing in size (What a mess!). Today I went back to sand it smooth in preparation for painting but the resin had not quite cured completely and gummed up my sanding disc. Daytime high temperatures here have been in the low fifties and the resin requires 24 hours at 70 degrees so I decided to wait until it is completely cured and hardened. Today is grocery day so I went shopping. Warmer today but still below 70 this afternoon. I guess I'll wait until tomorrow to get back to finishing that repair. Since anything else we do requires walking on that deck repair prudence dictates that we find something else productive to do, off the boat for the rest of the afternoon. Long term maintenance is not often discussed in cruising circles. Most often any talk of maintenance is limited to annual haulouts and occasional repairs. But, over time every part of the vessel must be overhauled if cruising is more than a once around adventure. After 27 years of ownership, we have now touched every part of the fabric of Lealea. At the completion of the current project we will have replaced everything except the hull itself, the mast and the stern rail. On April 1st, auspiciously, I took delivery. The first weekend in May we hauled out for the first time for a survey and began the maintenance journey. That first haulout wasn't much, really. Rick Monteverde, the previous owner showed that there were no repairs of the hull and that the boat was sound below the waterline. We checked the cutless bearing, rudder and stuffing box, sanded and repainted the bottom and put her back in the water. This is what passes for the "Annual haulout" for most boat owners. In 1992 I replaced the battery, back then just a single Sears Die Hard lead acid deep cycle marine battery. I also had new awnings made and contracted with a diver for bottom cleaning every 3 months at $100 annual rate and bought new rugs for the cabin. Late that year the original Volvo engine succumbed to salt water sucked into the exhaust. I sailed her sans engine until July of 1994 when I had the money to replace the engine. Haulout, bottom paint and new engine installed by Ala Wai Marine ran $7725 and took five months to complete. In 1997 Lealea got a complete new paint job. Pettit Trinidad Blue bottom paint and awlgrip from the waterline up. During that haulout she also got new standing and running rigging and new running lights, plus new cockpit hatches and companionway slides and boards courtesy of my best friend Jesse Woods. By 1998, a guest had snapped off the stern mounted whip antennae for the VHF so I replaced it with a masthead unit. While the mast was down we noticed athat the spreader bases needed replacing and had new ones fabricated at Ala Wai Marine. New mainsail and working jib and another new set of running rigging came in October. Laura was making Lealea into a more suitable home with new carpets, cushions and curtains, new cookstove and another set of new awnings with an improved design fpr more privacy. By 2004 we were beginning to prepare the boat for serious cruising. Laura got a part time job at West Marine and we took full advantage of the generous employee discounts to outfit Lealea with additional upgrades and additional equipment. We replaced the single lead acid battery with three AGMs with one dedicated to engine starting and two for house power. Where are you guys, where have you been, we are getting worried. It is Christmas eve. Chuck and I have spent almost the whole day together which is rare these days. As I write Chuck is putting the finishing touches on our Christmas video which will upload this evening or Christmas morning for some. My afternoon was blissfully spent drifting around town using my camera for the first time in a long while. No video, no video. For the where. We are in Petersburg, still, spending another memorable Christmas, enjoying the hospitality and friendship the town has to offer. The longer we stay the more friends we make and Julebukking has once again been the highlight of Petersburg's Christmas tradition. Where have you guys been. My position at Waterways Veterinary Clinic has become a full time position as clinic/retail manager and assistant. All my personal friends will understand how much I am thoroughly enjoying myself by combining my love of animals, boating and retail. I am in doggy heaven. Chuck has been spending his afternoons editing video, writing, practicing the coronet and playing Island Music to local residents on KFSK radio. Winter is here and Spring fast approaches. In January we fly to Seattle for the boat show. To complete Lealea's refit we need a new sink, a new cook stove, foam cushions for the main cabin and a few other bits and pieces. The real work begins again in March when Andy Cowan, our carpenter, says he will have time for the project. Now, I must run. My sourdough rolls (made from 100 year old starter) are coming out of the oven. Chuck has just started baking the Christmas video and we are ready to sit down and begin our Christmas Eve tradition of binge watching our favorite video(s), "Horatio Hornblower". Finished with our afternoon walk and taking a moment catch up on events. Chuck is heating stew for dinner while I take a few moments to update the blog. KFSK's annual fundraiser and membership drive kicked off this morning with a potluck brunch. As usual it was entertaining and delicious. Quiches, waffles, biscuits and gravy and specialty sweets and pastries. When this community does a potluck it is a beautiful thing. Returned last week from my trip to Thorne Bay and Coffman Cove as veterinary assistant and deck hand aboard the veterinary vessel Hallie. Months of planning and co-ordination are necessary to make a voyage aboard the 50' Aluminum trawler designed specifically to bring mobile veterinary services to remote Alaskan communities. Never a dull day and it hardly feels like work with the constant parade of dogs and cats coming aboard. Jo, Alaska Floats My Boat, thank you for the loan of the pressure cooker. The bag of golden chanterelles was greatly appreciated for the delicacies they were. Thank you again. This week Monday and Friday I'll be volunteering in the KFSK pledge room. Last year Chuck and I held a live Google Hangout in Studio B, chatted with cruisers all over the world and shared some of Petersburg's local talent. If you donated last year we thank you and ask if you could do so again. Every year a contest is held to choose new artwork and the mugs, especially, are always collectible. The men's and women's tee's are good quality and the artwork accurately portrays KFSK's special relationship with the community. Chuck's Monday Island Music program this week will feature the music of Cuba. Tune in tomorrow afternoon at 12:35 AST (or after the Borough Assembly Meeting. If you've not had a chance to listen to Chuck's Street Beat program previously take a few minutes to listen in. (Live Stream Link) I'll be dropping in the studio occasionally to chat during the show. Work on the boat has slowed as Fall begins to set in. Daylight hours are growing short, the leaves are turning orange and there is a chill in the air. Soon we tuck in for Winter and begin editing video and work on the website. Lealea will not be finished this year. No worries, life happens, we are cruising after all. Another Winter in Petersburg enjoying the hospitality and friendship this community so freely shares and finding ways to give back. Jim Trefethen contacted us many months ago asking if he could include our story in his next book. We corresponded several times, sent him a few pictures and then completely forgot about it. Friday we received an unexpected package, kind of a big deal in our little town, and to our delight found inside a copy of "Sailing into Retirement". Chuck and I then spent the evening taking turns reading to each other and we had a thoroughly good time including several laugh out loud moments. Jim's book is thorough, entertaining and honest and for us to be included is an honor. If you are getting ready to retire and dream of sailing off into the sunset we suggest "Sailing into Retirement." It is a must read. Yes, it has been a while between posts. It was Summer after all. Time to start sitting down and writing again. 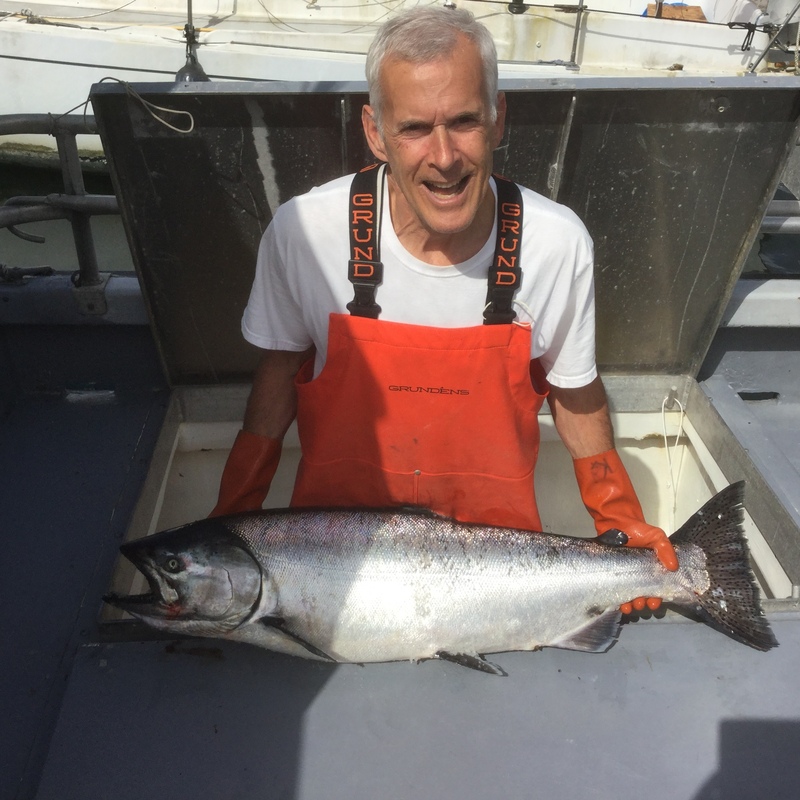 Chuck has expanded on one of his previous blog posts " The Aging Sailor" and we should have a new page up in the next few days. I have had a busy summer at Waterways Veterinary Clinic. Dr. Hill has had an extremely busy schedule and we are just now getting the the veterinary vessel Hallie geared up for her first trip out. By the looks of it there will be only one this season. Mid September and the weather is changing quickly. There was a definite nip to the air this morning. I'm looking at all the varnishing to yet be done and letting out a loud, resigned sigh. I am 67 this year (2016) so it appears I will not escape aging after all. So what's up with this aging thing anyway? I have been noticing that things don't work quite as they once did. I have less tolerance for unnecessary discomforts and less patience with fools. Being reminded daily of the most instructive moments of ones admittedly rather exciting youth is no doubt the genesis of Bette Davis' famous quote: "Old age is not for sissies". Some days are better than others, but the general trend is not promising. Nevertheless, we have no choice but to Deal With It. Obviously, things like pulling up a hundred pounds of anchor and chain without a windlass, hauling myself up the mast in a bosun's chair or leaping from the foredeck to the dock in bare feet are no longer in the repertoire. I take more time now. I am less likely to take risks, more contemplative and careful. Whenever possible, I con someone younger into doing the heavy lifting. What I lack in physical strength and agility I make up for with experience, patience and pursuasion techniques I learned while selling used cars in Honolulu. When I was younger I could, and did, live on pizza, Big Macs, burritos and beer without suffering any noticable debilitating effects. Youth and an active, outdoor lifestyle helped me shrug off the harmful effects of my eating habits. Fortunately, by the time I was 35 I had learned the benefits of exercise through experience and observation and was beginning to learn about nutrition from a mentor who was a gym owner and bodybuilder. For the next thirty years I enjoyed the benefits of clean, active living; Kayaking, hiking, trail running, biking, weight training and sailing in Hawaii. At the age of fifty, in the best shape of my life, I married motorcycle racer, SCUBA diver, marathoner, bicylist and triathlete Laura Wong. Needless to say, we lived a pretty healthy lifestyle. We were health conscious, but not health nuts. We were regulars at the Harbor Pub; at least once a week for Pizza and, for me, two pints of beer. Then we sailed away from all that. It is even easier to eat clean and get plenty of exercise cruising on a small boat at sea. That American creation on which I feed! Well, good god Almighty which way do I steer." Too much time in port? Could be. Still it is obvious I should have known better than to make occasional treats into a daily habit. Since I turned 65, I have noticed that drinking beer every day, even just one or two, will cause serious, and by that I mean excruciatingly painful, health problems. My enjoyment of a pint or two of IPA four or five times a week was not the only culprit. As the above quote from Jimmy Buffett indicates, my daily ration of beer was usually accompanied by a cheeseburger or slice of pizza which I consumed while seated at the bar in Kito's Kave talking sports, politics, hunting and fishing with with a handful of out of work deck hands and loggers. It has its appeal, I know, especially for Jack London or Ernest Hemingway fans; but it is not a long term habit one should cultivate if one aspires to good health and long life. Once the problem is identified and acknowledged a remedy can be effected. I know, and have always known, that a steady diet of beer and cheeseburgers is unhealthy. Whatthehellwasithinking? I was thinking that I was being "Moderate". By my own standards from thirty years ago, I was. Two beers a day, I thought. That's moderate. Make it one pint of draft. Sorry Chuckie. Not good enough. Not every day. You are not thirty seven anymore. Beer can no longer be an every day thing; not even a once a week thing for me. If you have arthritic joints and are prone to gout you should avoid certain foods. The list begins with beer. Beer is followed by other forms of alcohol, then shellfish and red meat, especially organ meats. The penalty for ignoring this is chronic severe pain. Now, I don't want to go all preachy on you but it is a plain fact that most of us have been poisoning ourselves with too much of a good thing to one extent or another for decades. It is just too easy to buy and consume the finished product of the food industry (Note to self: Don't preach) and too difficult and time consuming, in our busy 21st century lives, to eat only natural unprocessed foods, let alone foods that we pull out of the ground or catch and kill ourselves. While choosing what to eat may seem a simple thing, it is in truth the most important choice of your life and there are more serious questions than "Would you like fries with that?" Numerous studies have shown that eliminating all forms of refined sugar and alcohol and maintaining a proper Ph balance in the body cures or relieves the symptoms of just about everything and boosts the immune system to better ward off contagious diseases and infections. Regular exercise and a diet consisting of fresh, natural, unprocessed foods has been proven to promote general health. It is only good sense preventive maintenance. Active cruisers don't have to worry too much about getting plenty of fresh air and exercise. Just remember that regular exercise is even more important than diet as we age. When in port, a daily walk or bike ride to the grocery story for a backpack full of fresh natural food is all it takes but the more the better. No matter what your personal image of cruising into retirement might be, the tall cold brightly colored, sugary drink, heavily laced with rum and garnished with a miniature parasol or the ice bucket full of bottled beer should probably not be a regular part of the picture. For me, the cheeseburgers and beers will have to be few and far between in paradise. But there are plenty of apples and berries in the Northwest; and plenty of mangoes, bananas and papaya in the tropics. From the start we knew that the not always perfect Southeast Alaska weather would be a major factor. We have not been disappointed. Although we had a very mild Winter, it has still been wet. Very wet. We have been teased by some fifty degree afternoons recently but for the most part temperatures remain between the high thirties and the mid forties on the Fahrenheit scale. Rain has been near constant. Now that we have reached the point of transporting pieces between the boat and the workshop locations for fitting adjustments we need a few hours without rain. We made it down to the boat for the first fitting of the main bulkhead on Thursday but it has been raining heavily since that afternoon. The forecast is for dry weather (By Petersburg standards) for the next few days. A flurry of activity is in our forecast. We will be scrambling to get the bulkheads fitted so we can turn them over to Chris for glassing. There is still a lot of cleaning and preparation for the interior painting of the hull and reinstallation of the new bulkheads forward as well as the ceiling anchor strips. Meanwhile, back at the workshop, we have a lot of painting and varnishing to do on all the furniture pieces Andy has manufactured for us. Very soon now we will begin putting it all back together. It is taking longer to complete than we anticipated but, in terms of man/hours, we are still right on schedule. Cruisers on the beach working on putting the boat back together. Not looking forward to the next task at hand - crawling into the lazarette with a bucket of noxious liquid and a brush to scrub away 43 years accumulation of grunge and crud. I am waiting for a reasonably dry day, fortunately in the forecast for tomorrow, so I can throw open the hatches and work in fresh air and light, if not actual sun light. There are still a few more coats of paint and varnish to be applied to pieces we have already cut, some epoxy and glass work on the hull and two coats of paint over the interior fiberglass surfaces before we can begin putting things back to gether. While it is raining, we will get Laura set up to continue varnishing. The pieces I painted this morning should be dry enough to move to the other table this afternoon. Progress is slow but it is all coming together. We have been very busy lately but that is no excuse for neglecting our blog. The past week there just has not been much going on. It has been much too wet for painting and varnishing. Even indoors in our workshop the humidity is too high to get a good finish on the more visible parts. Our carpenter is sick with something his kids brought home from school so we have no new pieces to finish anyway. We could shoot hours of video of scraping and sanding the inside of the boat but watching it is even more boring than doing it even with the comical music and fast forwarding the video. Friend and shipmate Tom is arriving tomorrow to help with the project for a week or so. We hope he will bring some dry weather with him from San Diego. With Andy sick, we will have to work around the carpentry by removing the fuel tank and water maker so we can access the after bulkheads and get them out. It should not take any great level of skill to cut out the simple rectangles of the cockpit locker bulkheads and get them glassed, painted and reinstalled but we will be working without shelter on the boat. Hope it stops raining long enough to get that part of the job done. Meanwhile, Laura is going to Cordova, AK to work at the veterinary clinic there for a week. We could use the money to help with the cost of the project and she can't really help at this stage anyway until we have more of the furniture pieces and interior bulkheads cut. In terms of man hours and expenditures, we are right on track but the calendar is relentless as the unproductive days slip by. We allowed for weather delays but maybe not quite enough. The weather has been rainy and cooperative. We seem to be living in cycles of mixing expoxy, painting epoxy and waiting for epoxy to dry. This is just the beginning. In a few days we get the next wave of furniture pieces from Andy's shop that will need the same treatment. Every time we mix, every time we, paint we learn a little more and get a little better. While waiting for paint to dry we continue playing with sketches of the main cabin and galley. There are no plans to change the interior layout but we will be improving the usability of the hanging and head lockers. All our awnings are back from "Sew What" with the necessary repairs and we expect they should last several more years before needing any more work. I made a few additions to further reinforce the large, main awning with Annie's help. Spring is rapidly approaching and we look forward to finishing this big job and living on our boat again. Got a lot done yesterday and today. Andy, our carpenter, called first thing Monday morning and said he was sound again and ready to work. He dropped by later in the morning and picked up patterns removed from the v-berth and by mid afternoon several were already cut. While Andy worked in his shop I worked on the deck outside which has been drenched in sunshine both days. The temperature this afternoon reached 46 degrees, a bit less with the wind blowing gently along the creek. I've spent the last two days mindlessly sanding cedar strips and enjoying the view, very pleasant but still chilly. Tomorrow's highs are expected to be around 46 degrees again with no rain or clouds in the forecast. By tomorrow, all the v-berth pieces will be ready for staining, we've decided on #215 Red Oak, and 35 cedar strips will be sanded and ready for their first coat of penetrating epoxy. If the mild weather continues Chuck and I will spend the next four days mindlessly painting, staining and applying coats of epoxy. Last week we uploaded a video to YouTube showing us lowering and stowing Lealea’s mast. That video generated a lot of comments and questions so I thought I would take a little time to show more details. There are two keys to the process. First is the tabernacle itself. In this case, it is a simple stainless steel hinge with a flange to secure the base of the mast in place. It is made of what appears to be 3/16 inch or 4mm flat stock with a heavy bolt for a pin. Second is the stabilizing harness. The harness is in three parts. Two of these attach to the lower shroud chainplates and to the upper shroud clevis. The third part attaches to the after end of the boom and runs to the harness fitting at the upper shroud clevis on either side. The purpose is to keep the mast from swinging side to side as it is being lowered by keeping tension on the upper shrouds and to keep the boom from flopping over to one side. These guys need not be as tight as the rigging but must be snug enough to limit movement of the spars side to side. The procedure is to attach the main halyard or topping lift to the boom holding it at 90 degrees to the mast. Then attach an extra-long four-part tackle to the boom and traveler or other convenient fitting on the vessel centerline (We shackle two mainsheet tackles together). Next we set up the harness, nice and snug, keeping everything square and the boom on the centerline. Now we can disconnect the backstay. With a hand on the mainsheet tackle, give the headstay a tug to get the mast started moving forward. Control the descent from the cockpit with the tackle. Now you can work on that mast head tricolor from the dock instead of 35 feet in the air. To raise the mast simply reverse the process. Pancakes for breakfast but these ones were extra special. At a dinner we attended last week we sat next to a lady named Marietta and during the course of our conversation the topic moved to Sourdough. Turns out she has a 100 yr old starter that came from a family living on the Wrangell Narrows which she said she would be happy to share. I have been reluctant to take on a starter prior to this, especially one of this heritage, because of the care and feeding instructions. Marietta brushed off my concern, "There is always another starter out there if you kill this one." I see lots of Sourdough pancakes and rolls in the near future. It feels like Spring in Petersburg at the moment. We have had three very warm, dry days with temperatures in the high 40's. Perfect weather for getting things done. The dodger is off and the mast is ready to come down. We had the weather yesterday but Chuck managed to catch a bit of a cold and did not feel up to the task. While Chuck was working at the house I was able to remove the fore and aft seats and the starboard side settee. All that remains of the interior are the galley area, the faces of the lockers against the hull and the main bulkhead. Awnings will be washed by this afternoon and after they are dry they'll go to "Sew What" for repairs. Refit Video No. 10 uploaded last night. Made a run to the Salvation Army to drop off "stuff". As I handed over the bag to the volunteer I wasn't thinking about any of the items in the bag but rather the weight, thirty pounds of unnecessary weight gone. Woohoo! Our refit is gaining momentum. We are pleased with the progress so far and can only hope the rest of the project goes as smoothly. Refit video #9 - uploaded last night. Temperatures expected to be near 50 degrees today which will make our work much more pleasant. We removed the forward awning which is now hanging out of the way in the garage. The other two larger pieces will come down this afternoon and then all three sections will go to the laundromat for a thorough wash. The forward piece is in remarkably good shape and with the exception of a few small patches little will need to be done before it can be put into service again. The other two pieces will need a bit more attention but we cannot be certain of how much until they are down, cleaned and thoroughly inspected. Thankfully we've kept an extra few yards of Sunbrella material on hand to use for patches and repairs. Chuck's plan today includes grinding out the two old bulkheads in the v-berth that secure the water tank and completely emptying out the aft cockpit lockers. Amazing how much higher the boat is riding in the water! The next step will be removing the dodger and dropping the mast which means waiting patiently for the perfect day. We were approached a few weeks ago and asked for an interview by Captain Sailnator which can be found here and if you know anyone who reads German the translated version can be found here. Thank you Alexander for taking an interest and sharing our story. Progress continues. We got the call this morning our hardwood arrived by barge from Ketchikan which means we can get started cutting our patterns. I'll be giving Andy, our carpenter, a call later this morning and arranging our first day in the shop sometime in the next few days. Heavy rain expected all this week. Refit video #8 uploaded last night. We've been getting a tremendous amount of comments and advice from the boating and YouTube community. Thanks to everyone for your your advice and support during this project. Stuff you want but don't need. The weather the last few days has not allowed any varnish work to be done but at least we can still sand. Snow expected on Friday but Saturday and Sunday are expected to be clear which would give us some good working conditions. Not a good day to be on the water anyway, South winds 15-25 gusting to 35. Rain. Chuck is down at the boat now making a few final sketches before we begin stripping the interior furniture out of Lealea tomorrow. We've gotten all the ceiling strips off, the plywood for the v-berth is out and the water tank should be out by this afternoon. The meeting with our carpenter, Andy, went very well Monday morning. He looked at Chuck's sketches, seemed to liked the changes we have in mind and had a few suggestions of his own. Video #7 - Teaser. Phone calls have been made to price out new foam for the v-berth and settee cushions. This will be the third set of cushions since Chuck bought the boat. Foam material has always been fairly expensive but if we've learned anything over the years it is to not be cheap when buying it. It is our bed, our couch and our home and we want to be comfortable. The foam will probably ship out of Seattle which makes my eyes weep dollar signs at the thought of freight. It turns out there is someone in town with a good reputation for canvas work and it just so happened I had enough Sunbrella material on board to get her started on the new curtains. We will need to order more Sunbrella for the rest of the project but at least things are getting started. The cushion covers in the v-berth are still good and won't need replacing but since we are re-designing the starboard settee a new cushion and cover will need to be made. Finished inventorying all of our food stores yesterday. Besides a few canned goods that need to be eaten immediately because of a few rust spots our supply is almost exactly what I expected to be on board. And better yet, everything was in good shape, clean, dry and mildew free. Finished going through our other "Stuff" yesterday too. Clothes, hats, books...just stuff and managed to cull out a big bag of clothes and 2 plastic bins of items not important enough to be loaded back aboard. Next dry day everything we plan on keeping will get tossed into the back of the pick up and temporarily put into storage. I've taken a step back from Waterways Veterinary Clinic for the next few months which will give me more time work on the boat with Chuck and keep up with our daily blog. Chuck has been putting out video's on YouTube and I've not had a chance to post them here....sorry Mom. Cruising Lealea Refit No. 6: Actual Work! So far we are on track with our time but it is early yet. A few good days are needed to strip the interior and then one warm, dry day is required for us to drop the mast and then we can get started on removing the main bulkhead. Got a lot done yesterday but we've even more to do today. Trying to remove everything in an organized fashion so it will be easier to put back on board when the time comes. Chuck got a video uploaded of our progress last night. As several folks have noticed we have to do our moving at the right time of day or the ramp can be a bit of a workout. Books, why is it so easy to collect them and so hard to pass them on? We pick up our material order from AML this afternoon and expect to be removing furniture by the weekend. Clear skies and nearly empty boat. More of our belongings came off the boat today. Luckily we have had clear, bright skies and little rain to contend with while chucking our worldly belongings into the back of a pickup truck. Today I picked up the rest of the food stores that I was unable to remove yesterday plus our dishes, pots and pans and the first wave of boat gear; foul weather gear, boots, harnesses. Tomorrow I will be picking up the first tool in this project and begin removing the lamps, clinometer, barometer, thermometer and anything else mounted to the inside of the hull. We will be washing, sorting and closely examining the value of each and every item before it is loaded back aboard. As always, books will be the hardest to cull. There are only a few beloved items on board that will always make the cut. Poor Teddy has seen some better days. Got a phone call this morning (on MLK Day) that our materials shipment arrived on the barge, five days earlier than anticipated. We should have everything off the boat by Wednesday. It only gets busier from here. If you missed Chuck's radio program today, here is the link. We've been taking a break from writing and posting since Christmas knowing full well once our re-build project begins our days will be non-stop until it's completion. Yesterday I rented a storage locker and today we begin removing our belongings off Lealea. First off will be clothes and food which will be thoroughly inspected and sorted. Clothes we have held onto for sentiment rather than practicality will be given away and it looks as if we will be eating a lot of beans and rice over the next few months but it will be nice to get the boat cleaned out. I will be stepping back from the veterinary clinic for the next few months while we are working on the boat and am looking forward to my time in Andy's shop helping with the interior woodwork. Chuck placed our Fisheries order last Tuesday and we should see the materials arriving by barge next Wednesday. The hard lumber from Edensaw Woods will be on the same barge and then we only need the balance of the lumber to arrive from Ketchikan. The sun is shining, temperatures are in the 30's and it is a beautiful day to get this project started. Forgot to post the link to our Christmas Out Takes video for my mom. Lealea was already a well worn sixteen years old when I bought her from Rick Monteverde in Honolulu in 1990. Since then she has been lived aboard and used constantly and has received careful, if not lavish, regular maintenance and attention: a new engine in 1993, a cabin redesign, new standing rigging and Awlgrip paint in 1996; new rigging again in 2007 plus replacement of half of the interior furniture; an engine rebuild and new fuel tank and filter system in 2010. Along the way there were several changes of running rigging, new lifelines and new sails and awnings. Now it is time for some serious work. We like the basic design and layout of the Vega just fine. Having said that, we have developed certain preferences over the years and have some ideas we think will make Lealea even better. After unstepping the mast and inspecting the rigging, we will make decisions on how to proceed with that. While I think we can probably get by with just replaciing the halyards and topping lifts, I won't know for sure until we have the mast down where I can get a good look at the wire and end fittings. The mast and rig are first only because they have to come down before we can proceed on the interior of the boat. Dismantling the interior will go fairly quickly. The original furniture and bulkheads come out with a screwdriver. Removing our personal belongings and gear to a storage locker will be more work. Cleaning the stripped interior and prepping it for paint is the part to which I am not looking forward. I expect that will be the most time consuming, labor intensive and unpleasant part of the project. On the plus side, while that is going on, Laura and Andy will be making patterns and fabricating the pieces that will become the new bulkheads, ceiling and furniture. We are hoping that my old shipmate, Tom from Williwa, can join us for the final fit and finish work. We won't be making any major changes to the current layout with the dinette on the port side and the settee/bunk to starboard. However, we will be putting in a full ceiling of Alaskan Yellow Cedar and making some changes to the lockers to improve ventilation. In the Galley, Laura wants lexan cupboard and pantry doors and a larger sink. Some other small changes are planned for the furniture, generally, more solid lumber and less plywood, more curves and fewer corners. The major departure from the original design is that we will be glassing in the athwartships structural bulkheads and the fore and aft bulkheads that support the cockpit well, replacing the original construction of bare plywood secured to fiberglass tabs with machine screws. Before the new furniture goes in, we will be painting the interior of the hull with paint containing a product called Insuladd. Insuladd is a paint additive with insulating properties. We will let you know in a few months how it works. In a nutshell: We intend to take out the old bulkheads furniture and ceiling, use them to make patterns then fabricate the new pieces. Meanwhile clean the old space, repair as needed and paint. Rewire. Fit, finish and install new bulkheads, ceiling and furniture. The timetable is entirely dependent on the weather but we think we have allowed enough leeway to account for likely delays. Once the interior refit is accomplished we will turn to the rig and the exterior finish and skin fittings. Happy Holidays; meaning - Merry Christmas and Happy New Year! Mele Kalikimake e' Hauoli Maka Iki Hou! We are truly blessed to be part of such an amazing community. Merry Christmas to all our boating friends and family. We did something new with our Christmas video this year. Drake and Monique, of Drake Paragon's Real Cruising Life, organized this amazing collaboration. We were delighted to participate. Here is our 2015 Christmas card. Timing is Everything. Timing and Weather. What a spectacular day this is turning into! I just got back from my morning walk with the pups regretting that I forgot to slip a camera into my pocket. We set out in thick fog at about 0945 and headed for one of the trails around town. At 10:00 the sun just began to peek over the mountain to the East and the light gradually shifted from grey to gold. I turned around to look back along the trail to the NW and was startled to see the snow capped mountains across the Narrows towering above in full sunlight reflecting a golden glow back toward still misty Mitcof Island. The reflections off the ice crystals in the muskeg began to sparkle and catch my eye as I turned back toward the rising sun, now clear of the mountain but still with a halo of mist. Just then (I am not exaggerating) a flight of Canadian Geese, noisily honking to announce their passage, flew out of the fog not twenty feet over my head and disappeared into the glare of the sun. I really need to remember to bring a camera along. I got a stock check and quote from Edensaw Woods in Port Townsend, WA for the forest products we will not be sourcing locally. I just have to determine the exact quantities required, add a margin for error and place the order. Similarly, the resin, cloth, solvents, tools etc. we will be getting from Fisheries Supply in Seattle. Everything is readily available so there will be no backorder problems. We know that the barge runs twice a week and takes ten days to get here from Seattle so we can order after the first of January and expect everything to be here in two weeks. With luck we will avoid any materials delays as the job progresses. Before the materials arrive, we have to shift all our belongings from the boat into storage ashore until the interior is finished. Like everything else in our life, "Weather permitting" actual work will begin with removing the interior furniture during the first half of January. The part I am dreading is cleaning the stripped interior and preparing it for painting. But good preparation is the key to good results and the best way to deal with an unpleasant task is to plow through and do it so well you won't have to do it again any time soon. I have allocated 80 man hours to bare hull cleaning and fiberglass repair on the interior of the boat. If I have to do it by myself I will have to bust my but to finish that part of the job in two weeks. While the time consuming task of preparing the hull for painting and receiving the new bulkheads and furniture is ongoing, the new wood will be in process of being turned into our vision of the ideal Vega accommodations. We think the pieces can be fabricated in a 40 hour week. Finishing will take another ten days. Making the boat habitable will take another week. Eliminate the overlap of tasks and double that timeline and we are in the first week of March. I hope I have allowed enough time for this part of the refit. We will need to move back onto the boat the second week of April. Now that we have sharpened the pencil and begun the process, the plan is coming together nicely. We will be addressing each of these in detail in future blogs and videos. Before we can do anything else we have to be sure that we have an adequate place to work and access to the necessary materials and supplies. Laura spoke with the Boatyard owner and learned that the space we need is available at a very reasonable price here on Mitcof Island just South of Petersburg at Scow Bay. I researched, or rather confirmed, the price and availability of the materials we will need from Edensaw Woods in Port Townsend and Fisheries Supply in Seattle. We met with Andy Cowan, a local artisan boat builder, aboard Lealea to discuss what will be the most challenging part of the project – the interior joinery. Andy understood immediately what we are hoping to accomplish and had several suggestions with which we enthusiastically agreed. He recommended the suppliers we had already chosen but informed us that the Alaskan Yellow Cedar we would need for the ceiling is better obtained locally than ordered from Seattle. He suggested that Sapele would be a good choice for the solid hardwood pieces we would need. It is available, relatively inexpensive and easy to work with. Since Lealea came from the factory with Sapele veneer plywood and solid trim furniture we had already planned on using it. We discussed stains, finishes and construction details as well as the overall plan. Andy explained the way he would like to work on the project. As we had worked in Port Townsend with the Shipwright’s Co-Op, he would do the more advanced work such as milling the hard wood pieces while we did the less demanding but more time consuming tasks like disassembly, sanding and varnishing. He offered the use of his shop for storing materials and said he would give us any help we needed with the carpentry, including the use of his shop tools. One suggestion we are resisting, for now, is to take the rig down now and begin by removing the main bulkhead. This would be followed by the removal of all the rest of the interior. Over the Winter we would be able to fabricate the new furniture and have it ready when the boat comes out of the water in the Spring. On it’s face, this seems like a good idea but there are a couple of hurdles to overcome. First, the mast. It has to come down to relieve the stress on the main bulkhead. The mast is longer than the boat and we are already in a short slip so the Harbor Master may not like us storing it on the boat. Then too, we would have to find a place to store everything we own, including full fuel cans, galley supplies including the cook stove and sink, non-perishable food stores and tools, until we relaunch. Possibly not until August. We like the idea of getting ahead of the game but I do not like the idea of having the mast down for 6 months or more. Working on a compromise. The four major chunks of the job can be placed in any order except that the mast must be down, and the structural bulkheads must be in place before any deck work can be done and the hull inspection and any fiberglass repairs accomplished while the interior is stripped. The reason I originally listed the rig first is that I don’t want to order new rigging before a thorough inspection of what we have. New wire and terminal fittings can be shipped up in a week or ten days. Since raising the mast will be the last thing done prior to re-launching anyway, if we have to order materials we would have time to do so without delaying The Big Job. The plan for the rig then is simple, for now. We will remove the mast and put on saw horses at waist level for disassembly, cleaning and inspection. Then decide whether replacement of the standing rigging is warranted. As of right now, we can’t do that until we haul the boat in the spring. The exterior finish and fittings part of the job is simple and straightforward. It cannot be addressed until spring but preparations are already being made. Interior wiring and joinery. That is where we can get ahead of the curve. We just have to figure out a way to work around the main bulkhead. Then there is the budget. Andy estimated $2K to $2500 for materials to complete the interior. His labor/shop rate is $65 per hour but of course we have no idea yet how many hours he may put in. We are hoping not more than about fifty. The yard bill, including haul out, is expected to run $2000; if we can stay on schedule. As for the exterior refinishing, we know the labor involved in preparation, having done the job once before. We think we can do it with four helpers for the prep work and two for the actual painting for $4000 in materials and supplies. Add another $600 for bottom paint if we stay with our usual Pettit Trinidad Blue. Total it up. Add 20% and we come up with $15600 or there about. Might as well round up to $16K. It could easily run more but by starting now we can identify problem areas before they get too expensive and, by planning carefully well in advance, find areas in which to economize. We will also be doing more to raise funds for the project with more new content on the web site and more videos. Also, our YouTube videos now feature a Fan Funding button in the upper right corner of the video playback screen and there is a “Tip Jar” link in the left sidebar of this page if you would like to help out but cannot make it to Petersburg to get some bottom paint on your shoes. Although temperatures are still in the 40's Winter has certainly arrived. First snowfall is expected in a few days and we now find ourselves with more time to spend in front of a computer. The last of the snow free hikes for a while. I have been very busy this summer working at Waterways Veterinary Clinic. The town used to have a second vet who visited town 3 days a month but he recently closed shop leaving Petersburg's pets with only one option. Bummer. Just finished a video for the clinic website Waterways Veterinary Clinic - Veterinary Vessel Hallie. Secondary title, The cool stuff I got to do this summer! Chuck and I have been hinting at a new project for quite a while now and have just, in the last few days, solidified our plans. Our original thought was to take Lealea to Port Townsend for her haul out and re-fit but after spending more time here and getting to know the area we have decided Petersburg will do just fine for Lealea's much needed face lift. Last night Chuck posted the first of what will be an ongoing series detailing the initial planning stages through to the final steps of the complete re-fit of our old, beloved, fiberglass boat. Stay tuned. CruisingLealea.com will also be seeing a major re-fit. Over the next few months we will be converting the website to a Word Press format which should allow for mobile friendly viewing and easier conversation through the Logbook. This will be a Winter long project which we hope to have finished by April. Thank you Tom P. for your generous gift of server space and support. If you are looking for an old fiberglass boat to refurbish yourself we recently heard of an Albin Vega in Seattle that needs to be rescued or she will be demolished. Time is urgent which means a good deal to be had. In other news: I made a batch of cornbread. Henry David Thoreau was a connosieur of cornbread and mentioned that he preferred his made with rye flour. I thought I would try it. An inspired experiment that turned out GREAT! * When ever I mention "Maple syrup" I mean the real thing, preferably from Vermont and ideally from the Isham Family Farm in Williston Vt. Beat milk, butter and egg in large bowl with hand beater or whisk, then stir in the maple syrup. Mix dry ingredients thoroughly together then stir into the liquid all together and mix well. Pour and spoon the dough/thick batter into the baking pan and spread evenly. Bake 20 to 25 minutes until golden brown or until a toothpick stuck in the middle comes out clean. It was all I could do not to eat it all before Laura got home. We have been trying to get started on refitting Lealea since September 2012 when we waited in vain for a weather window to allow us to sail South from Craig, AK to Port Townsend, WA after our first season exploring Southeast Alaska. Haven't accomplished much though beyond really, really enjoying life. I have been in the - thinking about assembling my ideas into a general mental picture of the beginnings of a plan - stage all summer. Now, as we settle in for the winter (House sitting and pet care for the Harbor Master's mother), I am ready to sit down with a sharp pencil and begin. Since we know what we want to do, the first decision is where to do the work. An interesting possibility is Wrangell, AK, forty miles South of Petersburg. With a new boatyard facility, Wrangell, being farther South of LeConte Glacier and the much larger Stikine Ice Field is slightly warmer and drier. Waterways Veterinary clinic has their 50 foot aluminum trawler, M/V Hallie, set up as a floating clinic, and Laura thinks Dr. Hill could be persuaded to let us take her down there to live aboard while we do the work. Laura could operate the Vet clinic out of Hallie in Wrangell while we are there and that would save us the cost of lodging while bringing much needed services to the town. This looks like an ideal solution if we can put it all together. We will have to be very careful when it comes to ordering materials and supplies from Seattle. There can be no last minute changes or exchanges. Extra materials will have to be purchased, "Just in case". Work stopped for lack of some small item could be stopped for weeks, not just an hour or two as it might be in Port Townsend. ...but that has been our plan all along, every September since 2012. Going to Port Townsend will cost more but will be less risky and will give us more choices and flexibility once the project is underway. If I get in trouble with the job There are plenty of experts just a few steps away to whom I can turn. All things considered I am leaning toward Wrangell. I still have to check on some things at the boatyard there but taking to my neighbors in the harbor it sounds like thee will be no insurmountable problems. If we are going to do this in Wrangell, we need to figure out everything we need for the whole job and order it all at once in a single shipment if possible. Once I figure out what I am going to need in materials I can develop a budget and start arranging for yard space, tools, shipping, lodging etc. Might as well make a video or two of the planning and preparation process. Time again for a Hangout. Back aboard our boat. Back in action. The website and blog have taken a back seat for both Captain and First Mate as we soak up the last few days of sunshine before Winter sets in. The last couple mornings have had a snappy tone to them. Our Assistant Harbormaster was kind enough to find the very first ice patch of the season before any other harbor tenants could. Things are hopping at Waterways Veterinary Clinic. The veterinary vessel Hallie returned to last Sunday to Petersburg after 8 days of rounds between Thorne Bay and Coffman Cove. Dr. Hill had hoped to stay longer in Coffman Cove but we had to leave after only 27 hours in port. A front was expected the following night which might have held us in for another week and we couldn't spare the time. This week has been spent transferring medical equipment and supplies off Hallie and back to the clinic until her next trip out which will probably be next spring. I wonder where we will be. This week will be spent volunteering our time to help our good friend, KFSK, with it's yearly fundraising efforts. Wednesday, October 7th Chuck and I will have our 5th Google Hangout live from Studio 2 at KFSK. Pop in and live chat, we would love to hear how your summer went and introduce you to some of our friends in Petersburg. Mindy Anderson,"What's for Dinner", plans to stop in and share a few of her favorite boat friendy recipes. Tom Abbot will talk story about the history of the KFSK mug and Petersburg's own Harbor Master, Glo Wollen says she might stop by. We are going to be up front. KFSK is special to us and we have offered to help any way we can. There will be a toll free line for brief chats and we will be giving away two super cool, boater friendly, FSK mugs. We would love to see a few small donations trickle through. Join our Google Hangout #5 on Wednesday, Oct. 7th, 12 - 2ish. Use the Time Zone Calculator if you need. Just got off the phone with Tom, the station manager at KFSK Petersburg. I regretted doing it but I had to decline filling in for the regular host on the "Its Classic" program tonight. I did "High Country" on Tuesday afternoon as well as my regular Wednesday Street Beat "Island Music Program" this week. I have done the evening Classical Music program before but it takes a lot of time to put together a decent radio show and I was tired and was looking forward to going to bed early. Gradually making progress on the boat. I had a diver clean the bottom and replace the zinc. Finally got the batteries replaced, with help from friend Eric. When it come to things like batteries, I like to get someone younger to do the heavy lifting. There is not much more I can do until we get down to Port Townsend Next summer. Major work on the rig, painting and interior joinery will have to wait. Still, Lealea is not in such bad shape that we cannot take her out for a few days or even an offshore voyage. We are hoping to get away for a few days in September to shake the cobwebs out before the Winter sets in. In the Spring, we will begin preparing for the offshore trip to Port Townsend. Saturday morning. We are working on our second cup of coffee while Chuck responds to emails. Work on converting our website to WordPress has gone slower than anticipated with both of us having other things to do. Our new batteries have arrived by barge from Seattle so Chuck will be installing three new Group 31s in Lealea sometime this week. We bought the last batteries in 2007 just before we left Honolulu on our first passage and they've just begun to show subtle signs they need to be replaced. Shocking how much the prices have gone up since our last purchase. My trip on the veterinary vessel Hallie last week was a busy one. The weather was fine with mill pond conditions for most of the trip to Thorne Bay, Coffman Cove and back. We had just arrived in Thorne Bay and had clients knocking on the boat within minutes. The constant parade of cats and dogs aboard Hallie kept us on our toes and we got to visit with many two and four-legged friends. I had the opportunity to visit with Jo (Alaskafloatsmyboat.com) who has offered to take me mushroom hunting during our next visit if there is time. Looking forward to it. The Hallie is expected to depart again in 5-6 weeks. Chuck has been working with KFSK on the launch of their YouTube Channel in an effort to help with fundraising efforts. Chuck's Wednesday 8/5 Street Beat program link available here. We are losing 4 minutes a day and the sunshine beckons us outside . After a brief but hard rain last night the sunshine returned this morning making it perfect berry picking weather which means I'll be spending some serious time in the kitchen this weekend. Last week we were pleasantly surprised to get an email from Drake Paragon saying he would be mentioning Cruising Lealea in his next episode. We have been following Drake and Mo for some time and enjoy watching their travels. If you've not had a chance to check out their YouTube Channel be sure to do so, we hope you enjoy watching their journey as much as we do. And finally we finished off the bag of Beach Asparagus that Jo of www.Alaskafloatsmyboat.com gave me while the Hallie was visiting Thorne Bay. This is my new favorite vegetable, added bonus that a little bit of it goes a long way. I sauteed it with garlic and onion and a TBSP of maple syrup to give it a sweet/salty flavor. Yum! Now I'll have to go exploring and find where it grows on Mitkof Island. It has been a busy week at Waterways Vet Clinic and word is the next trip aboard the Veterinary Vessel Hallie is expected to be at the end of the month. Slow but sure progress on moving our website over to WordPress but the sun is shining and it is very difficult to stay inside for any length of time. Just finished my lunch, listening to the replay of today's Island Music program on KFSK Petersburg. Two hours rich in brass. Featuring Cuban artists Desi Arnaz, Cubanismo, Lena Ferrer and more. Looking for material beyond Hawaiian music I began looking at the Carribean. Jamaica, Haiti, Dominica and of course, Cuba. I remembered Desi Arnaz from the I love Lucy show like everyone else of my generation, and knew that he had been a band leader. Remembering that he had performed Babalu on an episode of the Lucy Show, I started digging. I was delighted at what I found! Arnaz's Cuban big band sound blew me away! Amanda Lane's vocal performance on Cuban Pete is icing on the cake. The program finises off with a collection of smaller ensembles and solos from Jose Conde, Lena and Rene' Ferrer (Lena Ferrer's "Ay Mi Vidita" is a catchy, upbeat piece), Ramone Cordero and others from the Cafe Cubano collection. Returned from Seattle where I was delivering two cats from the Petersburg Humane Association to their new home with my Mother in Gig Harbor. Don't they have stray cats in Seattle? Yep, they do, but these two cats had been at the shelter nearly their whole lives (2 and 3 years). Sweet cats that just needed a loving home and I knew my Mom would give it to them. Well worth the trip especially when combined with celebrating my Grandma's 90th Birthday. Chuck and I will be out and about all afternoon with the 4th of July Parade scheduled for 11:00am, Bed Races, Duck Races and a Log Rolling Contest to watch along with food and craft booths scattered along Nordic Drive to explore in between events. KFSK Fundraiser BBQ in the parking lot at Kito's Kave while we wait for the Blind Rowboat Races and the 2 X 6 Stomp races to begin. (will definitely get pics of this one!) Fireworks are scheduled after dark at 11PM. We are house sitting again in the same place as last summer watching Lily the Cat. I've already been out berry and rhubarb picking in anticipation of doing more canning while we have access to a rather fine kitchen. Chuck finished the 6th and last video in the Williwa series and will be taking a break from editing for a bit to get some actual work done on the boat. Sunshine expected into next week which would provide the dry weather needed to finally get some varnishing and fiberglassing done on Lealea. And again, being in a house will allow us to spread out our computer gear and accomplish the arduous task of migrating our website to WordPress and a new server. Our goal is to have everything moved over by the end of July. Meanwhile, the dry weather beckons us to come outside and play and celebrate our nations founding. By far the biggest rock in my pile, however, is converting this web site to Word Press and moving it to another host. The combination of dissatisfaction, a change in Google’s search algorithms and a timely offer of help from a friend have prompted us to take action now. Suffice to say that this move will result in us saving money while providing a more mobile friendly web site that is easier for us to develop and maintain. What this means to you is that one day in a few weeks the site will look different and be more accessible. Better, we hope. Unfortunately this is not the best time of year for this sort of project. I need to take full advantage of every [relatively] warm, dry day and every available hour of daylight (seventeen hours, fifty one minutes today) to get work done on the exterior of the boat. I need to get organized and start getting things done. The good thing is, I have a checklist for boat maintenance at least.